← Barriers: Real or Imagined? “There was no money,” said my mother in response to a question I’d asked her last week about my grandfather. “He was pre-med at St. Bonaventure‘s,” she said. My grandfather was a 1st generation American whose Italian immigrant family had settled in upstate New York close to the turn of the 20th century. His father died when he was very young leaving a family of 6 children. His mother remarried. Tony – as my grandfather was lovingly known – never went on to med school. Had I heard this story before? This time I heard it in a new way. “What about loans?” I asked, my voice escalating to a slight shrill. My mother just shook her heard. “There was no money.” Full stop. Since the start of my transition I ‘hear’ barriers in an entirely new way. Honestly I’ve been struggling with the question: do career barriers exist or are they imagined? Was there really no other way for Tony to overcome his financial hurdle? Career barrier? A 2005 study released by the Oxford Journal defines career barriers as “events or conditions, within the person or in his or her environment, that make career progress difficult.” Difficult. Not impossible. Barriers? Manuel London of SUNY Stony Brook published some of the simplest perspectives that I’ve found in his 1998 “Career Barriers: How People Experience, Overcome and Avoid Failure.” To Mr. London it seems that barriers exist in two camps; incremental barriers, like a boss who doesn’t like your style or framebreaking barriers, like a sudden loss of physical capabilities. The author notes that incremental barriers can pose as framebreaking. Was Tony’s financial barrier framebreaking? After business school I encouraged a friend of mine to join me for a weekend at Kripalu, a yoga center in western Massachusetts. In my mind’s eye I can still see her looking at me in an odd way….as if saying, ‘you’ve got to be kidding me.’ We were attending an afternoon session outside on the center’s front lawn. A leader asked each attendee to hug a tree. Absolutely true. No exaggeration. So what does this have to do with barriers? On the same trip I attended a session on stress. The instructor challenged attendees to separate stress from stressors that trigger the stress. In the little reading that I’ve done on barriers, psychologists seem to direct folks to identify the barrier separate and apart from your emotional reaction to it. Seems awfully similar to the Kripalu’s stress recipe. Can you tell that I am all over the board on this one? Where do you fall out? Have you ever been stopped by a barrier? I have and it wasn’t my imagination. Early on I had no money to pursue a business that was very much my next career goal. In hindsight the lack of funds caused a time delay…not inaction. Later I was again buffeted by a barrier. It was at my last employer. This one almost caused me to resign. I was a target of a badly behaving executive; political jockeying would be a better description. In the end he lost his job. But it was a long, hard fight. I will say that I kept my courage thanks to Len Schlesinger’s mantra, ‘it’s the one who defines the problem correctly that wins.” I think this is where I fall out on barriers. Barriers exist. Our ability to navigate through, around or over them is all in how we define the problem. I saw Tony just before he died. I stopped by unannounced to a nursing facility he was at. Everyone in the family had cautioned me that he might not know me given the advanced stages of his disease. The instant I cleared the corner and was in eye sight of him, I heard his spirited, ‘hi, Linda.’ I wish I’d had the chance to understand from him how he processed his medical school ‘full stop.’ For my playbook, suffice it to say that I will keep re-framing until the barriers seem non-existent. Take 2 Post-script: Readers, my apologies to those who received an email yesterday leading you to an empty post. I hit the wrong key while drafting. Hopefully the above was worth the wait. 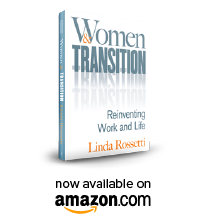 This entry was posted in Observations on Transition and tagged career barriers, career transition, career transition issues, HBS, italian immigrant family, Len Schlesinger, Mauel London, observations from a women's transition, Sheryl Sandberg, women's professional transition, women's transition, women's transition issues, women's transition process. Bookmark the permalink.